Improving medical facilities is not enough. If the people do not possess the financial power to opt for these treatments, then it will not hold ground. For this, state authority of Uttar Pradesh has implemented a new scheme that has been designed for state government employees and pension holders. Under Pandit Deen Dayal Upadhyay Rajy Karmi Cashless Chikitsa Yojana such candidates and their family members will receive treatment free of cost. Offering affordable medical treatment – The state government has implemented this scheme with the aim of reducing burden of medical bills. It will also help to increase the overall standard of medical development. Cashless treatment – Under this scheme, former and present state government employees and their family members will receive treatment without worrying about its payment. The state authority will pay treatment bills. Selected hospitals only – Applicants will be able to receive this free treatment at government as well as private medical centers, as long as that medical institute is listed under this scheme. For applicant and family members – Both state government workers/pensioners as well as the members of their immediate families, will be allowed to receive free treatment, as per the guidelines of this developmental project. Total beneficiaries – State authority announced that it aims to reach as many people as possible. For the time being, it has started with an achievable target of 17 lakh families. Diseases enlisted – Treatment of serious and incurable disease has been included in the list of permissible ailments. Apart from this, primary and tertiary treatment will be made available. Issuance of State Health Card – All selected applicants will receive a State Health Card from the respective State Medical Health department. Only after the issuance of this card, applicants will be able to attain cashless medical treatments. A resident of Uttar Pradesh – There is a residential criterion that highlights that only those state government employees and pension holders will be able to get these benefits who are legal residents of the state. 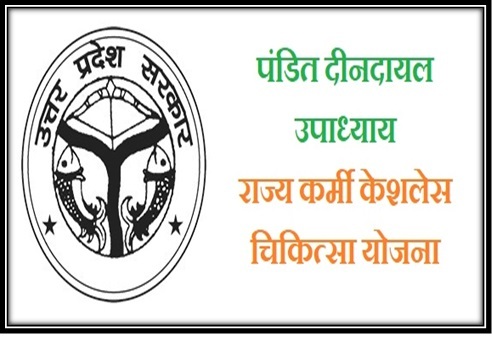 State government employees and pension holders – This unique medical program has been designed and implemented by Yogi Government for those applicants who are either serving under any state government department or used to work in the same. In short, former and present state government employees will be able to enroll. Age no bar – No age bar has been mentioned in the scheme draft. Thus, all applicants who fulfill other eligibilities will be allowed to enroll and attain cashless treatment services in empanelled hospitals. Residential certificate – As the scheme has been launched and implemented by UP government, it is mandatory for all enrolling candidates to offer adequate residential certificates as well. Service record and documents – In case the candidate still holds a position in any state government office and works as a permanent employee, then he/she needs to offer substantial evidence to enjoy these perks. Service records, salary slip and other legal documents must be submitted. Pension holder card – In case the applicant is a former state government employee, and now gets a monthly pension from UP authority, he/she has to furnish such documents. The pension holder’s card or similar relevant legal documents are needed. Aadhar card – Possessing an Aadhar Card is a must. If any person desires to attain free treatment under this project, they need to furnish their Aadhar Cards. Without this card, their application will not be recorded. Several government hospitals as well private medical institutes have been enlisted to provide these cashless treatment facilities. Any person who wants to get hold of this list will have to click on the official scheme link http://uphealth.up.nic.in/pis/shc/index.aspx/. As soon as you place the mouse pointer, two options will appear. One is marked as ‘Government Hospitals’ and the second is marked as ‘Private Hospitals’. Applicants can get both lists by clicking on the options. How to get the application form? Uttar Pradesh state government has highlighted that applicants, interested in enjoying the perks of this scheme will have to enroll via online method only. There is no offline application process. So, interested candidates must lob on the official scheme page by clicking, i.e. http://upsects.in/#. For online enrollment form, they need to click on the link http://upsects.in/public/applyreg.aspx. How to apply under the scheme? All interested applicants will have to click on the official link of the scheme. This will give them to the digitized application form. Only online application procedure will possible. All interested state government employees and pension holders will have to click on the link http://upsects.in/# to get to the authorized page of this scheme. When the page opens, applicants will get several tabs, present on the top of the page. Here, claimants will get the digitized enrollment form that must be filled and submitted to complete the application process. One can also bypass all the above mentioned steps and get to the form directly by clicking on the link http://upsects.in/public/applyreg.aspx. Several fields are marked here. Applicants who desire to attain this cashless medical facility will have to fill in these details. Personal details like name, address, contact details, gender, birth date, name of the office, Aadhar Code and email of the applicants are necessary. Once this is done, applicants need to pick their respective district. The same selection process must be followed. After this, applicants need to attach a scanned copy of their recently clicked snap with the enrollment form. The dimensions of this snap must not be more than 20KB. It will save the application in the state government’s database. Then respective authority will take necessary actions. In case any applicant has a doubt about the application or otherwise, he/she can dial the toll free number 8010108486 and acquire assistance. The phone number of the respective office is 0522-6671125. All calls will be answered between 9 am and 6:30 pm (Monday to Friday.) One can also send an email to the address support@upsects.in. The scheme will not only ensure free treatment to state government employees who are currently working, but will offer the same perks to those who used to work under UP government. These developmental reforms will go a long way in guaranteeing proper medical treatment to the applicants, without worrying about money.